You&apos;ll find plenty of opportunities to try new adventures, enjoy great music, and take advantage of the city&apos;s incredible outdoor spaces. Whether you enjoy trail running, hiking, cycling, paddling, or climbing, you&apos;ll find plenty of opportunities to participate in October 5-21, 2018. A fun day on the river plays right into the spirit of all gamblers. Paddle your way to fun prizes by collecting tokens, and then swap them for the best poker hand you can get! It&apos;s fun, casual, and free for all Wild Trails members. If a 10-mile swim sounds too intimidating, check out the Snail Darter. 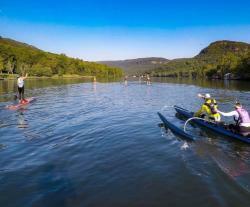 You’ll swim a .5-mile or 1-mile course downstream along the Chattanooga Riverfront. This family-friendly event is a great way to see Chattanooga’s beautiful downtown scenery from the Tennessee River. Come run the largest and most competitive 50K trail race in the Southeast. The 17th annual StumpJump takes place on the beautiful single-track trails of Signal Mountain and Walden Ridge and features more than 4,500 feet of elevation gain. Register here. 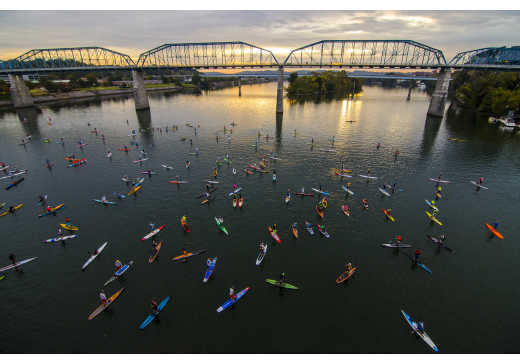 The 7 Bridges Marathon offers runners an excellent tour of the city as they cross the Tennessee River multiple times during this popular race. Some points of interest include the Tennessee Aquarium, AT&T Field, Creative Discovery Museum, the Riverwalk, Bluff View Arts District, Hunter Museum of American Art, and the historic Walnut Street Bridge before finishing the 26.2 mile run in Coolidge Park. Register here. The Trailblaze Challenge is a 26-mile hike benefitting Make-A-Wish East Tennessee. The hike begins at the base of Cloudland Canyon and finishes atop Lookout Mountain at Lula Lake Land Trust. Enjoy the beautiful fall foliage along some of the most beautiful trails in Georgia and Tennessee while helping to grant the wishes of local children with life-threatening medical conditions. Register here. 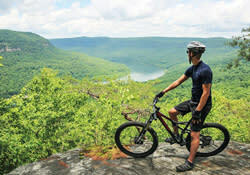 Join Outdoor Chattanooga for a guided, downhill mountain bike adventure starting at the top of Lookout Mountain and ending in downtown Chattanooga. This family-friendly outing is great for beginners and a great way to experience the Guild Trail and the newest section of the Tennessee Riverwalk in St. Elmo. Make a reservation here. The 5 Points 50/25 is Chattanooga’s ultimate endurance mountain bike race. 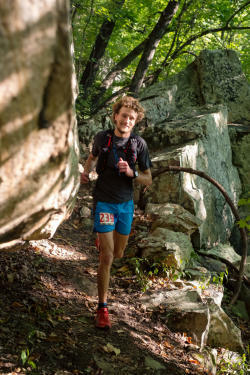 Racers will enjoy a grueling course packed with single track, climbs, downhills, rock gardens, and smooth flowy trails through Lula Lake Land Trust and the Cloudland Connector Trails. Post-race activities include camping, music, vendors, and food. Register here. This legendary climbing competition takes place at Stone Fort (formerly known as Little Rock City) and is one of the reasons Chattanooga has become one of the premier bouldering destinations in the country. You&apos;ll be able to see some of the best climbers in the country take on all kinds of boulders – or try some for yourself. Register here. Join Outdoor Chattanooga for an outdoor music series that’s free and family friendly. Gather around a campfire at the City of Chattanooga’s Greenway Farm and enjoy a fall evening in a rustic setting. Don’t forget to bring your blankets, camp chairs, and, of course, marshmallows for roasting! 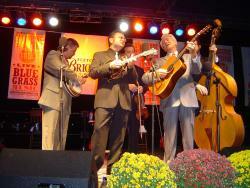 The 3 Sisters Bluegrass Festival is celebrating 12 years of free music and fun presented by Fletcher Bright Company. Grab your friends and a lawn chair to enjoy 2 days of live bluegrass music from Della Mae, The Infamous Stringdusters, MIpso, and more. View the full lineup here. Get ready for some high-flying family fun at Sculpture Fields at Montague Park. The skies will be filled with colossal and colorful kites, stunt kites, and Rokaku battle kites. Experience parachute kite races, performances by Chattanooga Aerials, hands-on activities, local food trucks, and beer. For more events and information, click here.